Built by Curtiss as a model H87-B3 in Buffalo, New York during 1941. This aircraft was the 513 of 699 P-40Fs powered by a Rolls Royce Merlin engine with a shorter fuselage. Delivered to the U. S. Army Air Force (USAAF) as P-40F Warhawk serial number 41-14112. Disassembled and shipped overseas to the South Pacific then reassembled. Disassembled and loaded as cargo aboard USS Nassau (CVE-16) across the Pacific to New Hebrides then reassembled. Assigned to the 18th Fighter Group, 44th Fighter Squadron "Vampire Squadron". Nicknamed "Pee Wee" assigned to flight leader Captain Sam Hitchcock (who was on Oahu during the Japanese attack on December 7, 1941). Other pilots known to have flown this P-40 include Captain Elmer 'Doc' Wheadon. On December 20, 1942 one of four P-40s that took off from Bauerfield Airfield on Efaté on a training and navigation mission. The other aircraft in the formation were flight leader P-40 piloted by 1st Lt John E. Little, P-40 piloted by 2nd Lt Frank Radzuikinas, P-40F "Bone Crusher" 41-14205 plus this aircraft. Thirty minutes into the mission, the formation encountered severe weather and ran short on fuel. The four P-40s force landed in a clearing atop Mount Santop on Erromango. All four pilots were unhurt in the landings. The two aircraft piloted by Little and Radzuikinas belly landed successfully. 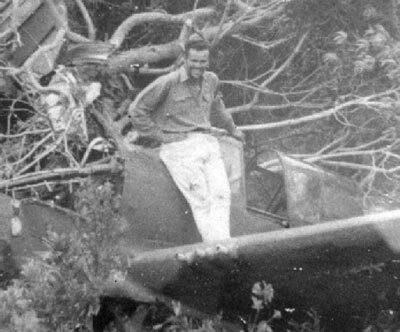 During the landing, this P-40 and P-40F "Bone Crusher" 41-14205 went over an embankment and were badly damaged. During the war, Americans cleared a path to the aircraft and stripped them for parts. 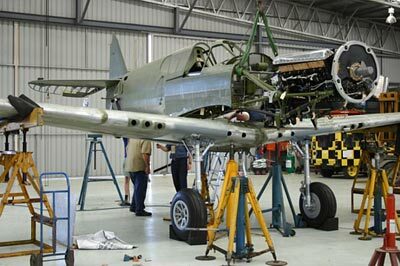 Over the years, more parts were removed, including the fuselage star, cut out of the side fuselage. This P-40 remained in situ until November 1989. 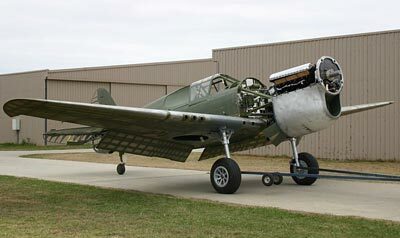 During November 1989, Robert Greinert, Ian Whitney and Martin Mednis salvaged this aircraft and P-40F "Bone Crasher" 41-14205 (along with parts from two others). The wreckage was containered and exported to Australia. "In 1989, I decided that, with the price of rare warbirds increasing rapidly, and as these were the only known Merlin powered P-40s ever found, it would be worth trying to get the aircraft. I traveled to Vanuatu only to find that an Australian group had arrived four weeks earlier and that the P-40s were on the wharf, ready to be shipped to Australia." Restoration began in 1990. Purchased by Australian Judy Pay and registered in Australia as VH-HWK. During 1990, Pioneer Aero Restoration began restoring the fuselage, tail, engine and wings. Afterwards returned to Old Aeroplane Company at Tyabb. Restored to flying status with its first flight by Stephen Death on April 22, 2009.